We provide a range of free, professional supports and services for the person living with dementia, their families and carers. This includes providing assistance with navigating the aged care and healthcare systems, help with paperwork, bureaucracy and ensuring your patient has access to all the services available in their state or territory. 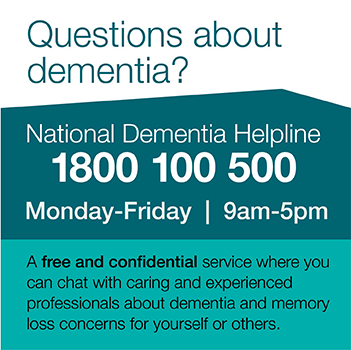 Please recommend your patient calls the National Dementia Helpline on 1800 100 500 to access this support.